Friday 13th may be unlucky for some, but not for me. 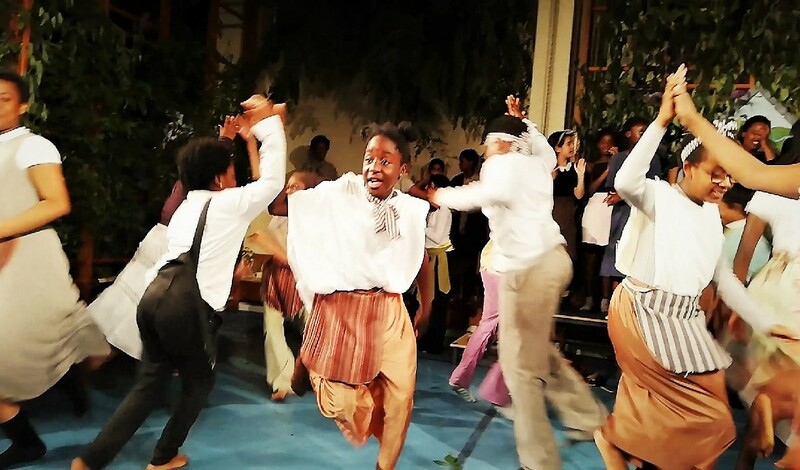 On Friday July 13th I went into London, to Tiverton Primary School in Tottenham, to see the second performance of a musical play based on my book, The Wolf's Footprint. It was an exhaustingly hot day -- and I got lost. I interrupted several people as they were going about their business, to ask the way to Tiverton School and every single one of these randomly selected people was as friendly and helpful as could be. Several pulled out smart-phones and entered the name of the school, so they could show me where it was and guide me on my way. Thanks to them, I found Tiverton in time for the afternoon session. So thank you, kindly people of Haringey and Tottenham and especially those -- you know who you are -- who were stopped by a hot and dishevelled writer asking, "Do you know where Tiverton School is?" Then I got to relax in the staff-room and chat to violinist Anna Jenkins and drummer Sebastien Hankin until it was time for the evening performance. The play was first performed in 2014 and you can read about it here. The performance this year, with a different cast, was every bit as good. As as I said to the packed audience at the end, I knew how it was going to turn out, but I was on the edge of my seat the whole time. Wicked courtiers try to dissuade the king from helping his starving people -- in song. The music moves from the sad and poignant to the boisterous and joyful -- and how the children danced so energetically -- with encores! -- in that heat, I don't know, but they did. The oldest cast members were no more than twelve but they performed with a confidence and engagement that was a delight. joy and admiration' I could only echo her. As the head of this wonderful school she has good reason to be proud. As the Head Governor of the school told me, as we sat in the front row, Resham not only nutures all kinds of artistic expression at the school, but they have great academic results too. And, of course, there is Kate Stilitz, who wrote the music and lyrics and directed, drawing such wonderful performances from her young cast. Follow the link for a look at Kate's website, where you can see something of the many song-cycles and musical pieces she has written for children to perform. The villagers celebrate the arrival of food. Kate also supplied the trumpeter, Ruben, as he's her son! Grow your own, that's the way. Congratulations, Susan. Sounds like great fun for all. I've also experienced the admiration you've expressed for the performers. Many years ago, before trying novels, I wrote for the stage and was commissioned by Aberdeen Children's Theatre to write special plays to celebrate a couple of their anniversaries. They were all just ordinary Aberdeen kids with a range of ages but no pretensions - just enthusiasm. With a cast of betweeen 30 and 50, I knew that, for some scenes, I could just write some general indications of the mood and effects I needed to be conveyed, and they and the director would improvise something beyond anything I could have scripted. Working with them was always a joy. Thanks Umberto! -- And Bill, yes, it's just joyous, isn't it? How completely joyous this post is and how splendid it must have been to see the performance of something that was created in your mind! Congratulations to you and the young performers and the many adults who made this happen. Haringey? You were in my manor, then. Next time come round for a coffee, or in this heatwave iced tea or water. This performance looks amazing - what a lovely school!